The human side (and tragedy) of Warhol's Factory is revealed in the documentary A Walk Into The Sea. Like so many arty teens before me, I went through a Warhol period. I read Edie, became obsessed with the Velvet Underground, and bought the biggest, cheapest big sunglassesI could find. This phase ended, as it had for many of my peers, with a lingering appreciation for the Velvet Underground but a sad resignation to the fact that Andy Warhol, Lou Reed, and so many others involved with the Factory were at best slightly Aspergers-y and at worst raging assholes. 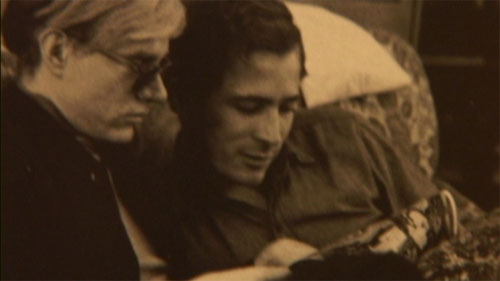 The filmmaker's uncle, Danny Williams, and Warhol. Like the Bob Dylan portrayed in Scorsese's No Direction Home, Warhol was very good at finding and exploiting other people’s talents and putting his spin on them, but not very good at being a decent human being. In the way Dylan used and dumped Ramblin’ Jack Elliott, Joan Baez, etc., Warhol cast aside Edie herself with the greatest of ease, as well as Danny Williams, who we learn about in this artful documentary, A Walk Into The Sea. The director, Esther Robinson, is Williams’ niece. She sets out to figure out why her uncle, an unsung fixture of the Factory scene, took a short night drive from his mother’s house on Cape Ann, MA, to the rocky coastline, and then vanished forever at age 27. There are many possible factors in Danny’s disappearance, from his sexuality (Brigid Berlin confirms that he was Warhol’s lover at one time) to his use of amphetamines (common at the Factory during that period, certainly for Edie). What seems to be an overriding motivation, however, was the crushing disappointment of being cast out of Warhol’s inner-circle, probably due in part to his addiction, but also due to the jealous and competitive nature of the Warhol’s crowd. Warhol and Morrissey at Max's Kansas City, 1968. To this day, Warhol’s old manager, Paul Morrissey, won’t give Williams any credit for the work he did creating the elaborate light shows for the Velvet’s early “Exploding Plastic Inevitable” performance art pieces, and is generally dismissive of Williams’ contribution. Robinson managed to get some of her late Uncle’s films from that period, however, and they show a great deal of skill and innovation. But what Williams had in talent he apparently lacked in competitive instincts, and his heartbreak over being rejected by Warhol, combined with a possible depression related to amphetamine withdrawal, probably caused him to take his mysterious walk into the sea so many years ago. I’m not sure if this movie is too slow or insidery for those who have no interest in or knowledge of Andy Warhol and the Factory scene, but for those who do, even if it was just a passing adolescent fascination, A Walk Into The Sea is a worthy contribution to the Factory canon, even if it’s portrait is just as ugly as so many of the others’.